I woke up this morning wanting to make soup for my office luncheon meeting. Up at 5:00 AM, roasting vegetables. Husband looking at me oddly, and finely asking, “What are you making?”. As the vegetables roasted I grabbed a cup of coffee and sat down with Dennis for a few minutes of morning chit chat. I love the mornings, lighting the fireplace, having coffee, talking about the day ahead of us. 27 years married, work in a business together, we have much to discuss. We discussed issues quickly and made decisions and moved from topic to topic. This is our time to discuss our calendars, potential conflicts, kids, vacation ideas, work strategy. I learned a long time ago to keep our discussions for the morning. Discussing issues at night when we are both tired, just led to a restless, sleepless night for both of us. Everything is shelved when I come home until the morning. It makes for a harmonic evening. My tomato plants are nice this year. Already have quite a few tomatoes, so soup has been on my mind. My fennel is also ready to pick. And lucky me, someone gave me some fresh squash. Happy girl I am! Bring broth to a boil and add the vegetables after roasting. Simmer for 20-30 minutes allowing the soup to reduce. Using a stick hand blender, puree the vegetable soup. Serves a crowd 15-20 friends. Pour soup into crockpot to keep warm and take to your office and serve them lunch. Serve with grated parmesan and croutons. Excellent soup. You’ll love it! Order a cheese pizza and serve with the soup. You office mates are goin’ love you. Want more? Serve with Chicken Ceasar Salad. 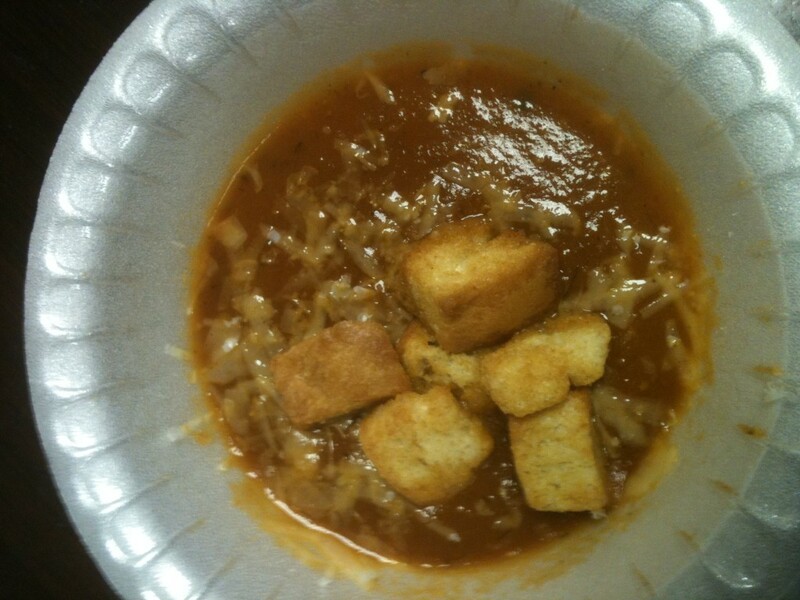 This entry was posted in Soup Kitchen and tagged Fennel, Onions, Soup, Squash, Tomato. Bookmark the permalink.